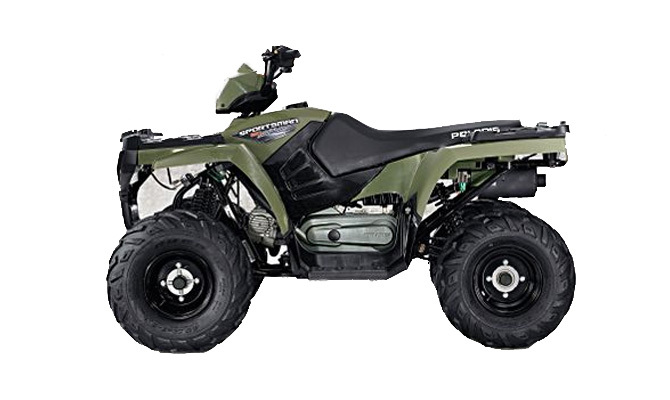 The 2009 Polaris Sportsman 90 is a Youth Style ATV equipped with an 89cc, Air / Fan Cooled, Single-Cylinder, OHV, 4-Stroke Engine and a Continuously Variable (CVT) Transmission. It has a 4X2 driveline. The Sportsman 90 has a Independent Front Suspension with 5 inches of travel while the Swing Arm Rear Suspension has 6 inches of travel. The Sportsman 90 has Front Drum Brakes and Rear Drum Brakes. The Sportsman 90 was introduced in -10019- and is Carryover for 2009. It includes a 6 month Limited warranty.